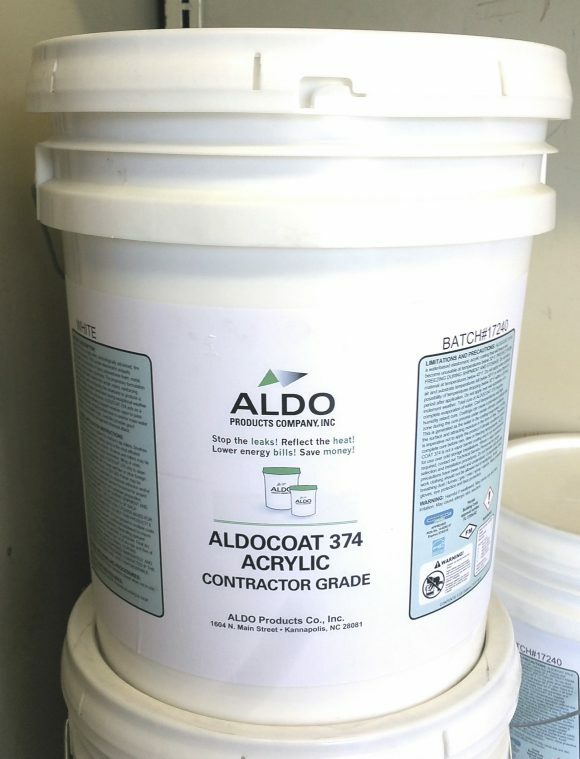 Aldocoat 374 has Excellent adhesion on Galvanized and pre-painted metal roofs, pigmented asphalt, single roofs, concrete, wood and built-up roofs, polyurethane foam insulation and many other single ply materials. For mobile home, RV and other metal roof surfaces, apply ALDOCOAT 374 at a rate of one gallon per 100 square feet of roof. 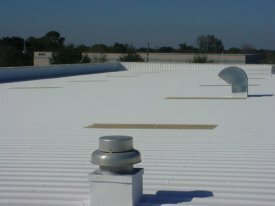 Coverage varies with porosity of surface and roof pitch. For maximun insulation, reflectivity and service life…two coats are recommended. ALDOCOAT 374 is the ideal choice for metal roofs, BUR and single ply restoration. This product carries the FM Global Approval (ASTM E108) over spray polyurethane foam and FM Severe Hail Rating (Class 1SH) over metal decks. The thixotropic nature of ALDOCOAT 374 permits high build coverage, even on rough, textured or vertical surfaces without pin holing or sagging. It also has excellent adhesion to a variety of other substrates, such as asphalt, primed wood, primed metal, concrete and masonry. Ponding water conditions are to be avoided. Please contact our Technical Service Department for primer recommendations for application over rusted surfaces. IMPACT RESISTANCE: exceeds 160b in/lb.